Can’t wait to see how this one pans out. As many of you already know, the 2018 North Dakota senator election takes place Tuesday, Nov. 6. The two candidates have been fighting for North Dakota for decades, and whoever gets elected I’m sure will do a fine job. 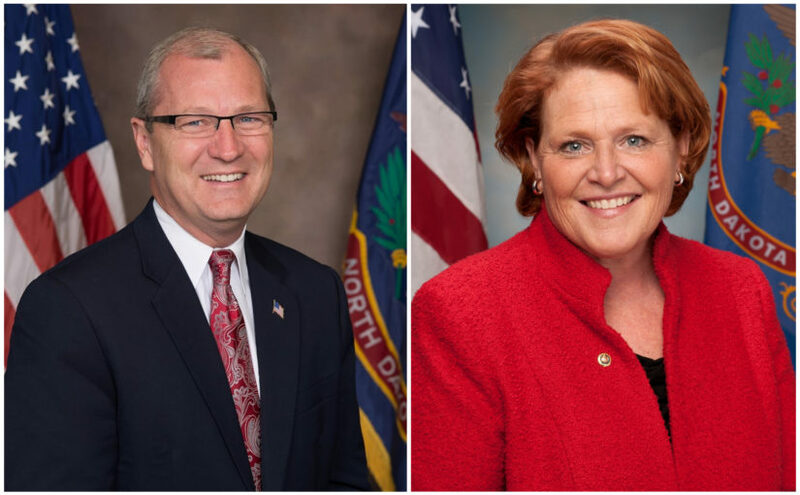 Kevin Cramer and Heidi Heitkamp have both put together excellent campaigns, but only one of them will be elected. I like certain parts in both of their campaigns, so it’s hard for me to make an informed decision. Both candidates care about farmers and agriculture, as they should. Cramer supports a strong Farm Bill that provides stability first and foremost. He claims he’ll make a push for legislation that will lead to much-needed relief for North Dakota producers who have been dealing with challenges ranging from drought to low commodity prices. On the other hand, Heitkamp looks to pass a Farm Bill with a strong crop insurance program and farm safety net. The state of North Dakota is heavily dependent on successful farming and agriculture. Making pushes to pass these farm bills are positives for both candidates. Health care is also a big issue looking to be solved for both. Cramer wants to get rid of Obamacare once and for all. He looks to replace it with a plan that is more patient-centered, flexible and, most importantly, affordable. He claims the alternative decision will provide more state control with more money and more flexibility for citizens. Heitkamp looks to bring down health care premiums and costs and to improve access for North Dakota families, seniors and veterans, regardless of where they live. She has also opposed any bill that would kick North Dakotans off their insurance plans and raise premiums. While I don’t feel Obamacare has been entirely bad, Cramer’s reasoning behind replacing it is reasonable. He says Obamacare represents a big government one-size-fits-all approach rather than allowing states to build systems that work for their citizens. This is why he wants to make the transition, and it seems like a logical idea. As far as the energy crisis goes, Cramer and Heitkamp both look to make a change. Cramer knows North Dakota is rich in resources, many of which power the region’s way of life. He’s going to fight for industries that produce energy. Cramer will fight to prevent out-of-control federal bureaucrats from creating regulatory roadblocks that cost jobs and deter investment. Heitkamp is taking a firm stance on this issue as well. She successfully negotiated and helped pass historic legislation that eliminated the nation’s 40-year ban on crude oil exports, boosting oil exports across the country. Now, she’s fighting to pave a viable path forward for coal through common sense solutions both sides can agree on. Heitkamp looks to make America energy independent rather than energy dependent. Cramer has stated his beliefs regarding abortion. He’s pro-life, meaning he’s anti-abortion and thinks it’s not correct. He claims every child should have the chance for life, liberty and the pursuit of happiness. I agree with this heavily. It’s wrong to kill a child no matter the situation. I understand every scenario is different, and sometimes you’d think it would be best for everyone, but that’s no excuse. There are foster homes and families that are always looking to adopt. It’s completely unfair that a person doesn’t get to experience life at all. It’s against the Christian religion as well, something Cramer promises to back up. He plans to reinforce Christian foundational values to protect the unborn, and I will continue to fight for pro-life issues. Heitkamp has pointed out the issue on infrastructure. She understands how much North Dakotans rely on safe roads to transport their families and to get to and from work safely. This is why she believes we need a federal investment in our nation’s infrastructure. Many truck drivers depend on stable roads to get to their intended destination, and I think this is an important issue to tackle. She’ll look to keep pushing for a federal infrastructure bill that invests in states like North Dakota. These are just a few issues both want to correct and a couple they each want to tackle. Overall, I think Heitkamp’s campaign leans more toward the needs of the state of North Dakota. However, Cramer offers ideas that apply to North Dakota as well as issues that every state deals with. I’m not going to disclose who I would vote for, but I do have a feeling Cramer is going to win this election. I think his ideas overall might reel in voters slightly more than Heitkamp’s. North Dakota is also a Republican state, so it wouldn’t surprise me to see Cramer win. I encourage everyone to get out and vote while you still can.